TAKAMATO Chikahito finally gets to take a trip to Kyoto and visit the Kitano Tenmanguu shrine. While exploring, he finds himself no longer where he was. Two adult males stand in trees while a pretty teen girl dressed in miko attire drops to the “ground” which ripples like water. The dark-haired male chastises the light-haired male for allowing a normal person in but the later male protests his innocence. A creature of lower rank than a mizuchi appears and the light-haired male uses magic to create a sword for the miko, named Hana, to use. With great flair, Hana dispatches these snake-like spirit creatures and then appears to target Chikahito. However, she was actually targeting the creature that had slipped in behind him. Chikahito is overwhelmed by this side of Kyoto which is didn’t want to see and passes out. Chikahito awakens in a futon with Hana’s head on his chest, asleep. The light-haired male announces the tabeyaki udon is ready which has her instantly at the table and eager. The dark-haired male joins them and they invite Chikahito over to eat with them. He’s surprised that they know his name, but since he passed through their barrier so easily, they wonder if he’s an assassin or from another hanamachi. After the meal, the dark-haired male recites a great deal of personal information about Chikahito and asks if he’s made any mistakes. This shocks Chikahito, but the dark-haired male says that the Internet and the hanamachi information network are responsible. After Chikahito learns that the place they are at is the hanamachi known as Kamishichiken, located next to the Kitano Tenmanguu shrine, it is decided that since Chikahito doesn’t have any powers or special abilities, they will get rid of some of his memories to protect Hana and her two male companions. 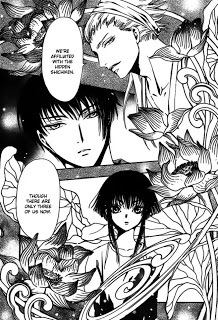 The light-haired male, Sakura, grabs Chikahito while the dark-haired male attempts to grill his memories. However, the procedure fails, leading Hana to grab Chikahito by the arm and run out with him. After showing him the outside of the place and saying this is where she lives, she begins to glow and kisses Chikahito on the lips. As Chikahito faints again, Hana tells him that she is here and waiting. And end this manga right. Still, I am a sucker for CLAMP I suppose, having enjoyed several of their works. So even though I’m expecting the worst, I will bravely move forward! Because of her hairstyle, Hana reminded me somewhat of SUZUHARA Misaki (Angelic Layer) only with Yuuko-san’s eyes (xxxHOLiC). So, apparently she’s a miko warrior and can kick arse. Does her kiss of Chikahito mean anything romantic? And speaking of Chikahito, if he’s so “normal,” why was he able to resist having his memories erased? Since this is a monthly title, I’ll go ahead and read it for the heck of it. We’ll see how things go. 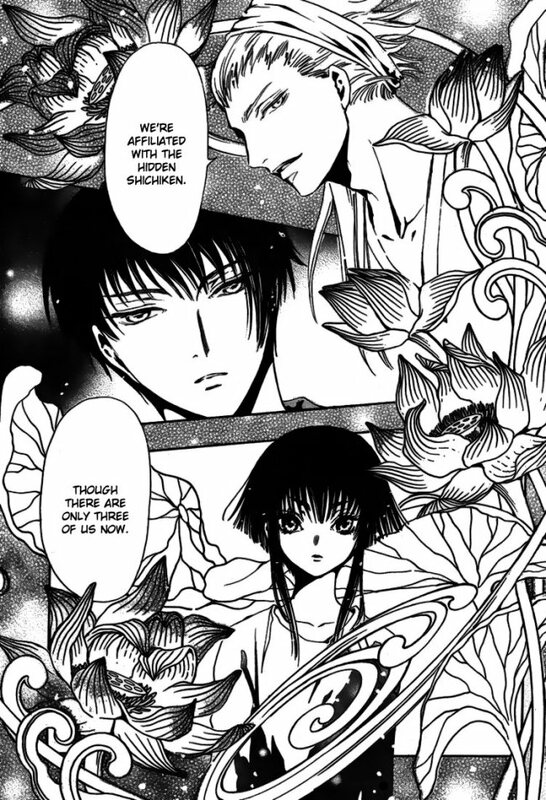 I think it’s funny how you’re predicting Hana is Yuuko’s reincarnation and Chikahito is an AU version of Watanuki (he does have some traits of him, though he also reminds me of Syaoran somewhat). How come I never thought of that! But it wouldn’t really be a surprise since CLAMP likes to use their old characters as reference to their new ones and have old characters return for cameos. I kind of like CLAMP for that. I’m really hoping this series won’t end up like their recent series. I really like CLAMP and reading their work is always fun. So I’m crossing my fingers with Gate 7. Damn you, you made me remember that goddamn catchy song. Oh, your toe bone connected to your foot bone. Your foot bone connected to your heel bone. Your heel bone connected to your ankle bone. Your ankle bone connected to your leg bone. Your leg bone connected to your knee bone. Your knee bone connected to your thigh bone. Your thigh bone connected to your hip bone. Your hip bone connected to your back bone. Your back bone connected to your shoulder bone. Your shoulder bone connected to your neck bone. Your neck bone connected to your head bone. @Shades – I have read chapter 1 and should do a review soon. ^_^ I too would like to see this series go somewhere but I’ll be reading this from the aspect of “CLAMP has no clue where the story is going” rather than my previous “I think CLAMP is going here” train of thought.